An interior designer needs to have vision, and that's exactly what Orlando Soria has. 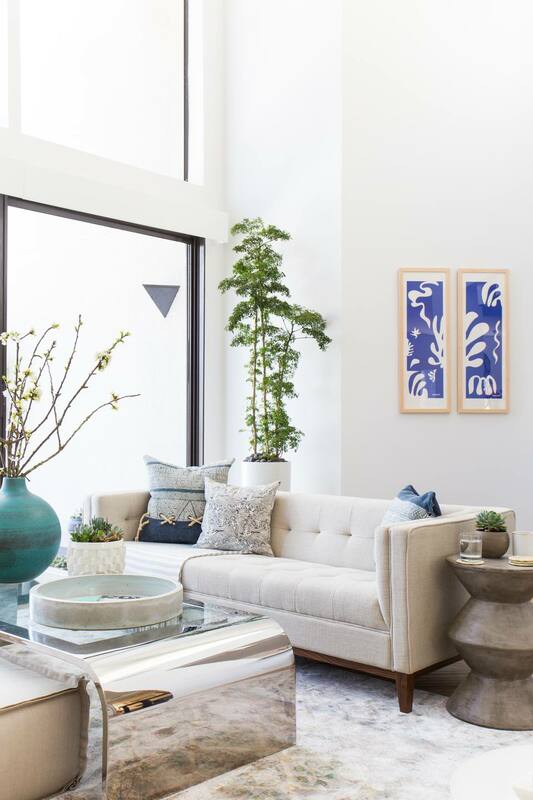 The West Coast Creative Director of Homepolish, Soria has been making a splash in the world of interior design, showing his skill for taking the most tired spaces, and transforming them into modern homes. His latest project has been the renovation of his own Los Angeles home. With a unique vision for a dated 1980s interior, Soria has created a modern LA home with style to spare. Bright white walls and mid-century furnishings bring this home firmly into the 21st century. The open floor plan is a staple of west coast style. Floor-to-ceiling windows bridge the indoor and outdoor space seamlessly, showcasing the perfectly styled patio. An eye for detail, it was Soria who saw the potential in this Silver Lake home that hadn't been updated in decades. Along with his partner Edouard, the two embarked on making the generic style of the condo into a home that expressed their aesthetic. The interior is filled with personal touches, including the couple's collection of art and decorative objects. Everywhere you turn in the Orcondo, there is something beautiful for your eye to enjoy. In the living room, a spiral staircase has been turned into the ultimate feature. With a backdrop of crisp white walls and a refined color palette in the living room, the staircase has a sculptural presence that stands out in the space. A visual artist himself, it's no wonder that Soria's home features a striking art collection. Walls are decked out in photography, paintings and mutli-media pieces. While on consoles and shelving, one-of-a-kind finds, like this set of sculptures in the entryway, add to the artsy vibe of the space. The dining room is a beautiful melange of styles. A rustic dining table is surrounded by Danish-modern wishbone chairs. Above the table, a set of brass chandeliers adds an air of Hollywood glamour to the space. The shelving in the dining room is home to the couple's growing collection of objet d'art. For Soria, the kitchen was a large undertaking. Brown tile and bulky cabinets were removed and replaced with streamlined finishes. White cabinetry, a brass faucet, all add to the modern details of the space. The family room is home to some seriously cozy seating. A velvet blue sofa makes for the perfect space for a respite while binge watching favorite TV shows. An additional white loveseat adds to the comfortable environment. To bring a dose of pattern into the family room, graphic art has been hung. This abstract piece, featuring black and white stripes adds to the eclectic nature of the space. And a cool totem side table echoes the geometric shapes in the framed art. To transform the master bedroom, Soria added moulding to give the room a sense of architectural detail. The room was then painted in a stunning shade of blue. Ralph Lauren's Iron Blue paint envelopes the space and adds a truly sophisticated touch. The choice of paint in the master is the perfect backdrop to some of the warm furnishings in the bedroom, including this stunning dresser with brass details. Just off the master bedroom is the master bath. Small and stifling, the couple transformed it into an open and airy space. Knocking down walls and installing new fixtures, this modern bathroom is a perfect retreat. The guest bedroom has been designed to be a multi-functional space. Part bedroom, part office, it's the perfect place for guests to enjoy an extended stay in sunny Los Angeles. The office continues the home's mid-century modern vibe, with a wishbone chair and streamlined desk. An oversized mirror above, adds a great dose of style that's also functional for guests when they come to visit.